It is a standard size 8, grading out to a 10 in the hips with a centre front opening instead of the asymmetrical opening and slightly rounded collar points. Everything else is as per pattern with no other changes. Well, there is not much else to say about my finished Jackie as I have already documented each and every step already, you can see all those posts here. I used extra large fabric covered buttons and love how they look, especially with the bound buttonholes. I am a huge fan of bound buttonholes, they are really worth the extra work to get them looking just right. I like it equally dressed up with a pencil skirt like I have here or worn casually with a long sleeved knit wool top and jeans. And here is a close up of the back – I love the position of the raglan sleeve seams, they give a really nice line to the back. The skirt I am wearing here is McCalls 5523, one of my favourite skirt patterns, blogged here. I am sorry about the overall blurry/out of focus element to these shots – the result of a tiny window of time for photos and a self timer on the tripod – the camera really hated the wall I am standing against. Mmmm beige on beige. The lining is a lovely silk twill which was a joy to sew and to wear, also from The Fabric Store. 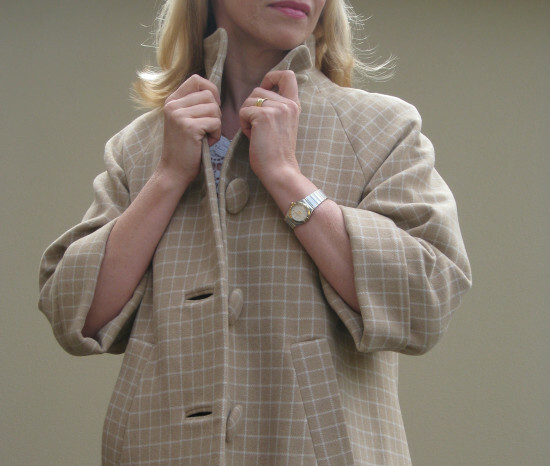 Although I toyed with the idea of changing the collar, the high neckline makes this coat very warm when buttoned up and no need for a scarf. If/when you have a finished Jackie you would like to share, you can either upload them to the Flickr group here or email me directly – you can find my email here or leave a comment below. And make sure you pop over to Maria’s blog to see her post on her finished Jackie – as expected, it is vibrant and lovely. All the posts from the sewalong are here plus there are heaps of construction and finished photos over on the Flickr group here.